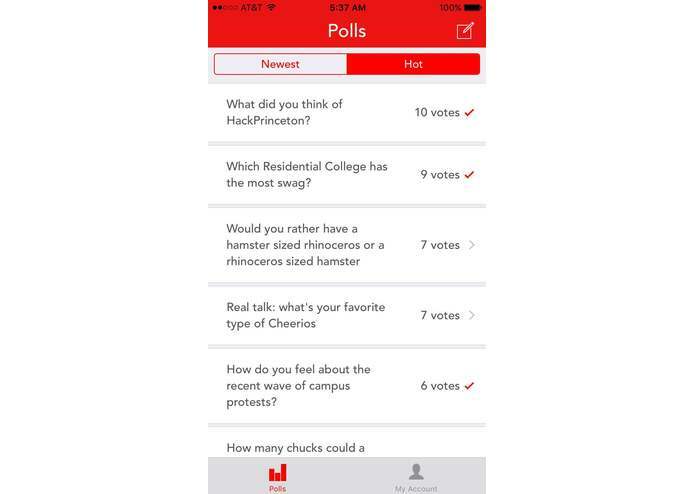 Users post anonymous polls on any topic they want, other people nearby will see their polls and post their opinion. We thought it would be cool. Besides, there's so many issues going on right now, an anonymous platform to voice your opinion in a concise way (no endless back and forth internet arguments, only a simple multiple choice question) could provide some interesting insight. 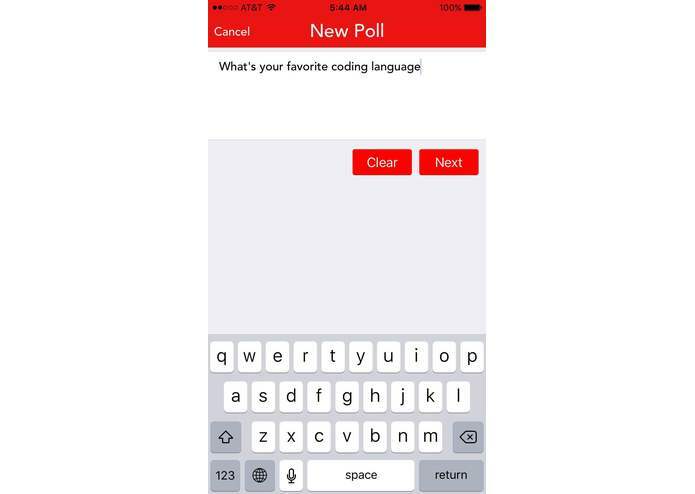 Users receive a list of short, 1 question multiple choice polls. To incentivize active participation, users are only able to see the results of a poll after they have already answered it. 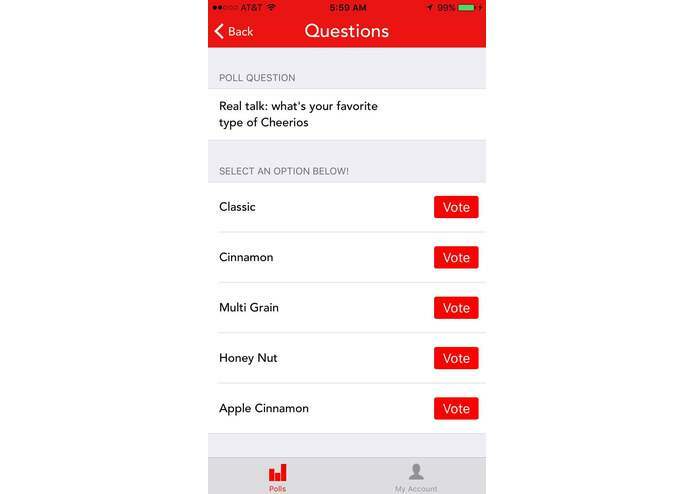 Users have the choice to prioritize newer polls or more popular polls in their feed, and the polls are weighted by location - a user typically will only see polls made by someone in a nearby area. 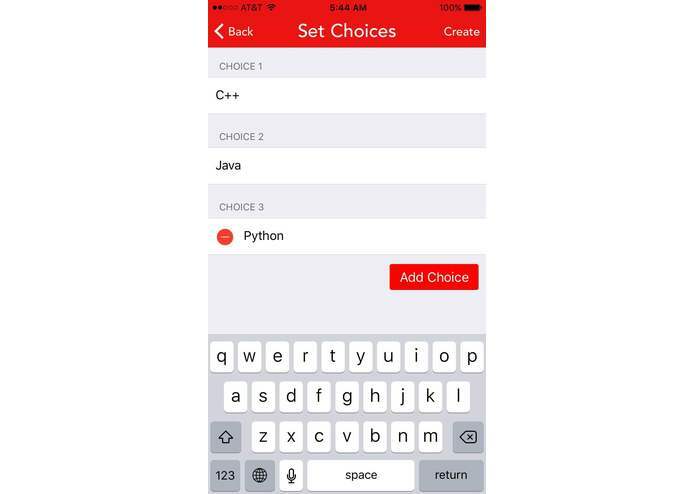 The frontend is an iOS app built in xcode and Objective-C. The backend is a Java 8 Maven project using the Spark Framework. Data is stored in a traditional MySQL database. The backend framework we chose, we chose for the sole reason that we wanted to learn how to use it. Learn we did, but we did pay a penalty in having to take time to learn how to use it in the first place, and then more time to fix the wonderful mistakes we discovered could be made. Also, coming up with an algorithm to calculate the nearest posts was deceptively tricky due to the curvature of the earth. Popularity based range was another difficult problem, we did a lot of experimenting with SQL before we could find an acceptable method of weighting a post's range and popularity together. P.C. - Don't pull an all-nighter the first night of a hackathon just for the sake of it, that is a good way to become burned out on the second day. (I recovered though!) A.P. - This was my first experience with hackathons so I really had no idea what to expect. What I learned is not only how to work closely with a teammate, but also how much you can learn just from listening. P.C. - We look forward to telling our friends all about this cool app we made, and then promptly going to sleep. In the slightly longer term, we plan on deploying to the app store and leaving our servers running for at least a month or two to see if our idea gains any traction with others, if it does, we hope to continue working on and improving this app to see where it leads us. There are plenty of extra features we could add (for example, giving users more control over their poll range/popularity weightings), and if we get enough users we would love to start doing some of the aforementioned analysis - many exciting possibilities from a very fun project!